It’s a very long time since I last read a book by Ngaio Marsh. My mother suggested I try Agatha Christie when I moved up from the junior library and a while later, when I’d brought home pretty much every book by Agatha Christie that the library had, she suggested that I might like Ngaio Marsh. I did, and again I brought home all of her books that the library could offer over a period of time. But I haven’t read anything that she wrote since. this day’s sailing. Apply within. The prospect of traveling by boat through the countryside that Constable painted was irresistible. She didn’t know that her cabin had been reserved by a man who has been murdered, believe by a master criminal the police call ‘The Jampot.’ But she found out, and that made her regard her fellow passengers with a degree of suspicion. I knew that she was right to be suspicious, because this story had such a clever structure. In Inspector Alleyn was using the affair of ‘The Jampot’ as a case study for a training course, and the story moved beautifully smoothly between his and his wife’s narration. An American brother and sister found a painting, that appeared to be an unknown work by Constable in a junk shop. And then there was a body. Scotland Yard was called, and Inspector Alleyn arrived to take charge. The plot was well constructed, complex and built on classic lines. I enjoyed the boat trip, but I was ready for the mystery when it arrived. I enjoyed watching characters I associated with the golden age of detective fiction in later life. They had matured well. And I enjoyed ‘people watching’ on the boat, and being pulled this way and that by a very clever crime writer. But I did find that the story had dated badly, and the very deliberate even-handedness on matters of race may have been well-intentioned but it felt too deliberate. The plot twisted to the very end, and the resolution came with the very last sentence. On one level that was wonderful, but I would have liked a little more explanation, because I knew who ‘The Jampot’ was, but I wasn’t quite clear about who was and wasn’t involved with art fraud. An epilogue on that police training course would have been a nice touch. And at the end of the book I’m back where I started. I liked the book, but not enough to go in search of more of Ngaio Marsh’s books. « Looking inside a book and finding my own world …. 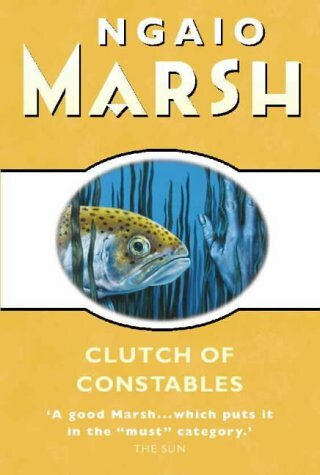 Gosh – I haven’t read any Marsh for, oooh, 30 years? I did like them at the time, but I find it hard to remember specifics – they didn’t stand out as much as the Christies. If I had infinite reading time I’d like to revisit them – but I find i’m being a little more selective nowadays. I did like the ones with Troy in most, I think! I haven’t read Ngaio Marsh, which is shameful really, because she was one of our city’s most famous citizens. Her home is usually open for tours but is undergoing earthquake repairs. I have read http://vandasymon.blogspot.co.nz/2009/05/ngaio-marsh-her-life-in-crime.html Ngaio Marsh, Her Life in Crime by Joanne Drayton which I found interesting, especially in terms of explaining the history of my city and Ngaio’s place in it. My parents had some of her books on the shelves when I was growing up (they belonged to a mystery-of-the-month book club), but I had never read them when someone recommended the TV series to me. That led me to the books, which I thought were much better. Lately though I’ve found her books less appealing – a bit plodding. I’ve never managed to read any Ngaio Marsh – despite being very familiar with many of her titles from when I had a Saturday job in the library. I wasn’t bothered by the TV series though I would like to try one of her books. This is an author I’ve never read, but feel I would like to try one day. This sounds like a good one. I have a few of her books but think I’ve only read one or two for some strange reason. I’ve very familiar with the television series but one must go to the books of course. An author I know of but never read. My mum said exactly the same, Agatha Christie the Nagio Marsh! Fleur was an alter ego. My friends and family have always called me Jane, and that's what I prefer these days. I've left my history here and moved on, and now you can find me at Beyond Eden Rock.